I have a fantasy piece of conceptual art: Become an art adviser to some hedge-fund bro whose surfeit of cash and arrogance is inversely proportional to taste and sensitivity. Start by purchasing, on his dime, bloated canvases by overrated blue-chippers; next, add in a heaping pile of kitsch under some banner of hipster irony, pay shill-inflated auction prices, hire a congenitally over-budget architect to build a vanity museum, collect exorbitant art-advisory fees, and all the while keep a running tab of the boondoggle — a printout of which is displayed as the final artwork. Damn it, though, I think the German conceptualist/trickster/ salesman/provocateur/celeb Christian Jankowski may have beaten me to the punch. Or at least, the homely paintings and drawings and off-kilter sculpture and videos that make up his current show at Petzel Gallery have punched a hole in my logic. So, let’s run this Jankowski thing down: Conceptualist? Keep reading. In the current show at Petzel, we are first confronted by a tower of drum cases tall enough, as it happens, for a man to stand inside (Contemporary Farewell, 2017.) A handout informs us that hundreds of spectators had gathered at a Leipzig museum to wish the departing director bon voyage but were told that the guest of honor had fallen into the gray plaster column while inspecting it and would deliver his speech from the interior. A microphone was set up to amplify his words and his heartbeat (the human drumbeat, as it were) as the speeches were delivered. This ungainly pillar (literally of plaster and metaphorically of culture) became an artifact of proper patrons and distinguished guests maintaining decorum amidst a ludicrous situation. Such work feels influenced by the installations of the brilliant Ilya Kabakov, which often focused on the darkness-at-noon absurdities of the Soviet Union. In one piece, Kabakov transformed a Spartan public toilet commonly found at bus stops in the Soviet provinces into a typically cramped communal Moscow apartment. “What Could Possibly Go Wrong,” 2017 COURTESY OF PETZEL, NEW YORK. Kabakov was born in 1933, and has youthful memories of Nazi tanks invading his homeland, which may explain why his fatalistic wit never quite erupts into full-blown humor. Jankowski (born in 1968, in Göttingen, West Germany) is from a more congenial background, and his work can be truly funny. But sometimes, as in a video in the exhibition that revisits the theme of art professionals consumed by their obsessions, the humor can be a tad broad. In 2017’s What Could Possibly Go Wrong, the setup is that Jankowski has brought an alligator and an animal trainer to welcome a new director to Michigan State University’s Broad Museum. In short order, the director is menaced and then swallowed by the reptile, but survives and gamely gives an interview, in situ, to a local TV news anchorman. Jokes about belly laughs and fake news aside, what does it say about the art world to morph a museum director into a lumbering, scaly predator? Salesman is a subset of Trickster: Jankowski once partnered with a boat manufacturer to offer a yacht and a stylish speedboat to the collector class, both of which would have a substantial premium added to their sticker prices if they bore his name, a case of the Artist’s signature enhancing the value of whatever it graces. Jankowski’s gambits have come a long way from Marcel Duchamp’s early-20th-century readymades, which were “chosen” — the key to understanding the artist’s role as cultural arbiter — for their rote utility. Duchamp’s workaday objects were so base that they kept getting thrown out, which is why we have only replicas of pieces such as his bottle rack (1914, also known as Hedgehog). One wonders what an institution such as the Philadelphia Museum paid for its copy, but if the original with its painted inscription were to ever miraculously turn up, its next-to-zero material value — transmuted through auction alchemy into nine figures — would prove both artists’ points. Which brings us to Provocateur, though perhaps interpreting the caricatures and paintings in the back gallery as “ugly” might trigger the retort, “Ugly is as ugly does.” In the series “Me in the Eyes of Another Actor,” the definition of “me” becomes a communal project. Last year, Jankowski asked pairs of artists who work in a Paris park, similar to the caricaturists in New York’s Times Square, to make drawings of themselves as Isabelle Huppert and one other actor, selected by Jankowski, on the same page. Huppert and her agent chose the photos from which her likenesses were rendered; portraits of such stars as Scarlett Johansson, Adrien Brody, and George Clooney were selected by Jankowski from celebrity portraits the artists keep on hand as samples of their drawing abilities. For the project, the artists were instructed to portray each other’s postures and clothes and then add the heads on each other’s bodies, a process Jankowski likens to “the iconic drawing from M.C. Escher, where one hand with a pencil draws the other hand with a pencil.” To take a single example from the dozen or so on display, a comically proportioned and smiling Huppert — her head pinched in at the eyes, her legs and a cartoonish easel sketched in quick outlines, has been contrasted with a grim, carefully shaded Gérard Depardieu. The skill levels vary from clumsy to serviceable to art-class standout, but anyone who has bought a caricature for a relative visiting from the hinterlands knows it’s the thrill of sitting for a portrait done by a “real” artist that makes the work important in a personal sense: It’s one of a kind and it’s me! Though in this case, who exactly is “me”? Huppert, who wasn’t even present? Jankowski, who directed the project? Or the artists themselves, their own bodies portrayed under someone else’s head? A similar transmutation of “me” occurs in the “Neue Malerei” (“New Painting”) series. Jankowski searched the Internet for images in which a person or group of people reenacted scenes from famous paintings, such as Rembrandt’s The Night Watch. He then sent the image files to artists in China who make their living copying famous paintings. In a number of cases, large sections of the canvas have been left blank because the folks who set up the tableaux vivants often did not take care to get the proportions correct. Hence, roughly the bottom quarter of the Rembrandt that Jankowski commissioned is bare, because whoever composed the ersatz Night Watch — despite taking the time to approximate the 17th-century costumes — neglected to include the receding arch positioned above the militiamen in the original. Rembrandt’s dark void adds unexpected formal dynamism and emotional depth to his theatrical but compellingly realistic masterpiece. The virtuoso transformed the information his eyes received from live models through the motions of his own legs, spine, arms, wrists, hands, and fingers as he worked upon the huge (roughly 12-by-14-foot) canvas, physical actions that distilled three dimensions into two. In the painted copy created from a digital image, much has been lost in translation. And yet, in this ouroboros of depiction — Old Master canvas to posed digital image to painted knockoff — Jankowski has captured the passion that art engenders. Because you have to really care a lot to dress up in period garb and plot out where the woman with the chicken stands, and someone has to wrangle the dog so that your photo is at least a ballpark imitation of the Rembrandt — or Richter or Van Gogh or Matisse — which has been put through the Jankowski blender. By using other people’s imagery, no matter how amateurish, Jankowski exposes the spark of life that animates great art, and the craving people of all persuasions have to experience its jolt. Creation requires desperately hard work, in which the artist must be prepared to corral a lightning inspiration one moment and play a protracted chess match of thrusts, retreats, and waltzes at another. There are no formulas. On an aesthetic scale, Jankowski’s commissioned copies range from banal to bizarre (the scalded-pink color of the bathers’ flesh in a “Cézanne” is pretty off-putting). Yet in their desire to literally inhabit the spaces of great art, the various folk that Jankowski collaborates with — at however many removes — recall the “Social Sculpture” of one of his forebears and countrymen, Joseph Beuys (1921–86). In 1977, the German city of Münster staged an open-air sculpture exhibition and invited the former Luftwaffe pilot turned sculptor/performance artist/conceptual shaman to participate. Always on the lookout for poorly considered social environments, Beuys discovered a concrete dead zone inside a pedestrian underpass, which one curator described as “a deep wedge-shaped acute angle in which nothing but dirt could collect.” Collaborating with the unknowing and obviously expedient architect, Beuys built an exact mold of the void and then filled it with twenty tons of melted animal fat, which took three months to solidify. The result was an angular, sixteen-foot-high totem that, unlike stone or bronze, contained an inherent warmth, an abstraction that radiated corporeal presence. Which leads us to Celebrity. 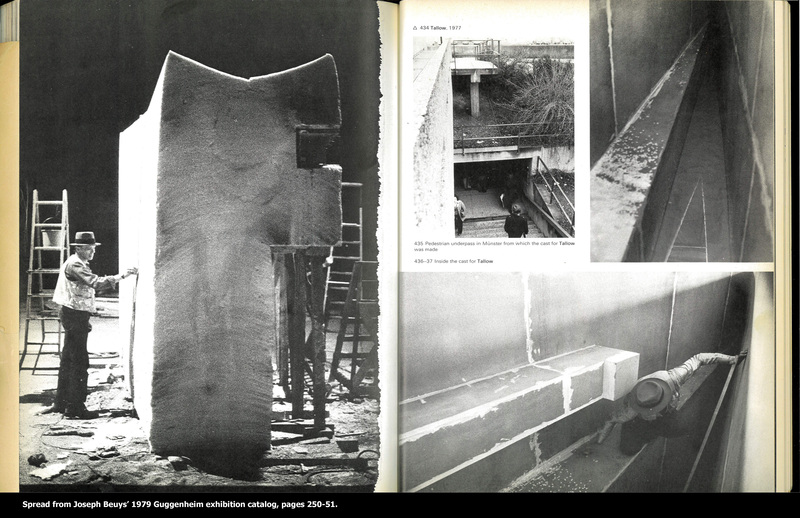 Jankowski was invited to participate in “Sculpture Project Münster” exactly forty years after Beuys pulled off his humanist intervention in that northwestern German city. But, similar to Andy Warhol’s turn as himself on TV’s The Love Boat, in 1985, Jankowski dispensed with objects and opted to make art from artifice. Jankowski is that rare artist with enough cultural wattage (in Germany, at any rate) to guest-star on the extremely popular police-procedural TV show Tatort (“Crime Scene”), which has run continuously since 1970 (and the title sequence looks it). Tatort sprawls across Germany, with episodes taking place in various cities. The Münster incarnation features two of the most popular characters, unkempt Detective Chief Inspector Frank Thiel and his insufferably high-falutin’ buddy (and landlord), forensics professor Karl-Friedrich Boerne. Hmmm. In a court of law I might ask, Who wrote the Jankowski-like lines for the Christowski character? Also, Who dressed Detective Thiel in a utilitarian, pocketed vest that very much resembled Joseph Beuys’s standard garb? (A Google image search for the characters does not show Theil wearing such a get-up in other episodes.) Münster is a cultural capital, so perhaps the show’s costumer was simply giving a visual shout-out to the sculpture project’s history.